NYTimes: At the time ''Rear Window'' was first released, there was a certain amount of self-righteous outrage directed at the film's seemingly casual attitude toward voyeurism, sometimes called Peeping Tomism. I was mystified by those criticisms, then and now, and not necessarily because all of us probably tend to peep at one point or another, given the opportunity. Hitchcock himself deals with this criticism in the film's classic final sequence, in which the suspected murderer, on whom Jeff has been happily spying for several days, confronts Jeff in person. ''What do you want of me?'' says the haggard, emotionally exhausted man. It's one of the keys to the movie. ''What do you want of me?'' Jeff doesn't answer, but everyone watching the film, spying on it, is suddenly brought up short with the realiza tion that our entertainment has been provided by a rather coldly cavalier attitude toward another man's anguish. Cinephilia & Beyond: What makes this film so good is the fact it could be seen and analyzed from numerous different perspectives. First of all, it’s a very effective thriller filled with nail-biting suspense. Secondly, since most of the film is shot from the main character’s perspective, allowing the story to be simultaneously revealed to both the protagonist and the audience, Rear Window is a wonderful examination of the voyeuristic qualities of cinema. Hitchcock himself stated he’s so proud of the film because it allowed him to tell such a great deal of the story by relying on pure visuals, but in case you still haven’t found the time or motivation to see it–rest assured, the film is nothing close to being an exhibition of indisputable filmmaking technique that Hitchcock is still so famous for. Underneath the murder mystery and all the gimmicks that make Rear Window such a pleasure to discuss, explore and dissect at seminars, workshops and film clubs, we have real human beings, well-developed and three-dimensional. 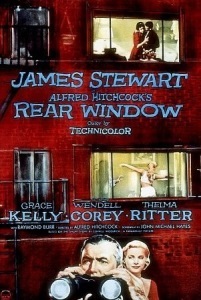 Rear Window is therefore a film about filmmaking, yes, but it’s also a complex movie with depth, range, humor and warmth that’s here, first and foremost, for our repeated pleasure. Roger Ebert: Jeff sits in his wheelchair, holding a camera with a telephoto lens, and looks first here and then there, like a movie camera would. What he sees, we see. What conclusions he draws, we draw--all without words, because the pictures add up to a montage of suspicion. The Guardian: If the film was critical of voyeuristic behaviour, Stewart and his co-conspirators would be proved wrong in their suspicions of Lars Thorwald at the climax, after they'd blundered into his life and destroyed his reputation. But this is Hitchcock, connoisseur of the perverse, and the film ended up saying the opposite of what I thought it should. Voyeurism has its rewards; keep a close eye on your neighbours and you might just root out a murderer. Watching Rear Window recently, I realised Stewart's voyeurism yielded another reward. What stood out for me this time was the film's panoramic view of romantic attachment and its pitfalls. What Stewart is really observing, in his multi-channel display of neighbourhood life, is marriage in its various stages and possibilities: the excited newlyweds pulling down the blinds in their new apartment; the bickering older couple who can no longer conceal their loathing for one another. Fun fact: the songwriter is played by Ross Bagdasarian, aka Dave Seville of The Chipmunks fame, so when you get the Hitchcock cameo, you have to assume that Alvin, Simon, and Theodore are hanging out just out of frame. I'm glad the post singles out this bit about Thelma Ritter because I think one of the key elements when Hitchcock is firing on all cylinders is the terrific performances he gets out of character actors who are playing supporting roles. In the post about North by Northwest I mentioned how much I enjoy Jesse Royce Landis' small role in that film (and slightly larger [and commensurately better] role in To Catch a Thief). Ritter plays a similar role here. The back of 125 Christopher St. was the model for the “West Ninth Street” sets for 1954’s “Rear Window” (inset, with James Stewart and Grace Kelly). Despite some cosmetic changes, the original buildings still stand. Nerd of the North, I totally get your thoughts about Vertigo. The one thing I can say is that hopefully if the viewer identifies completely with Scottie Ferguson through the entire movie, then hopefully they realize at the final shot that being creepy resulted in Scottie losing everything about his life that made it worth living and are driven to examine their own lives. But that's a discussion for another thread. If I had an indie movie theater, I'd do a double feature of this with Mimic 3: Sentinel. I probably wouldn't have an indie movie theater for very long afterward, but it would have been worth it.